The growing popularity of hi-tech devices, such as flat-screen TVs and digital radios, threaten to undermine efforts to save energy, a report says. UK consumers spend £12bn a year on electronics, much of which is less efficient than older technology, a study by the Energy Saving Trust found. By 2020, the gadgets will account for about 45% of electricity used in UK households, the organisation projected. It said flat-screen TVs and digital radios were among the worst offenders. Paula Owen, author of the report called The Ampere Strikes Back, said household appliances currently consumed about a third of an average home's electricity. But she warned this was likely to increase as a result of people buying more energy-intensive devices. "Your old-fashioned, bulky cathode ray tube TV on average consumed about 100 watts of electricity when it was switched on," Dr Owen explained. "What we are seeing now is a trend for much bigger flat-screened TVs. On average, we are seeing a three-fold increase in the energy needed to power these TVs. "Pretty much in every other sector [such as fridges and washing machines], we find that as the technology moves on, the products get more and more efficient. "Consumer electronics does not work like that." The equivalent of 14 power stations will be needed just to power consumer electronic devices by 2020, the report warned. By that time televisions on standby will consume 1.4% of all domestic electricity, it predicted. Digital radios were also singled out by the report as being energy intensive. "Traditional analogue radios consume about two watts when they are switched on," Dr Owen said. "We've looked at digital radios and the average consumption of these is eight watts." She added that listening to the radio via digital TVs or set-top boxes had an average consumption of more than 100 watts. 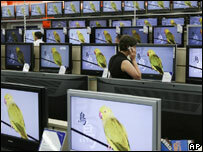 Recent research by the communications watchdog Ofcom said that more than 80% of UK homes now had digital TV. More people are buying digital TVs or set-top boxes because by the end of 2012 the analogue TV signal will no longer be available in the UK. But not all new technology was criticised by the report. "Mobile phones and their chargers are one area where we have seen an improvement," Dr Owen said. A few years ago, she said, the current being drawn by chargers that were plugged in but not actually attached to a phone was about three to five watts. "We have done some testing on the newest mobile phones and chargers you can buy today and reassuringly we could see that 'no-load' consumption had fallen below one watt." But she added that the sheer volume of mobiles being used, about 63 million in the UK, meant that a huge amount of energy was still being wasted if people were not unplugging their chargers when they were not being used. The report called for governments, manufacturers and retailers to do more to promote energy efficient devices, but also said consumers had a role to play. "The simple message to people is switch things off when you have finished using them," urged Dr Owen.